Police released this screenshot from a dashboard camera in a vehicle waiting for the light at South Sandusky Street and are asking anyone with information about the vehicle to contact their tipline at at (740) 203-1112 or Policetipline@delawareohio.net. Police are still searching for the driver of a vehicle that injured a man in a hit-and-run crash in downtown Delaware over the weekend. The City of Delaware Police Department reports that at approximately 11:36 p.m. on Saturday, two pedestrians were attempting to cross West William Street at the intersection with Sandusky Street when one of the pedestrians, D’Shawn A. Almanson, was struck by a vehicle entering the intersection. Police report that Almanson was thrown from the crash and came to rest under a car parked on West William Street. Police say the involved vehicle did not stop and continued traveling west. According to police, Almanson was stuck under a parked vehicle and had to be removed with the help of the Delaware Fire Department, who had to use tools to jack up the parked car. Almanson was transported to Grant Medical Center for treatment. A GoFundMe page set up for his medical expenses notes Almanson suffered several injuries, including a broken femur, two broken legs, and a broken elbow. The GoFundMe “D’Shawn’s Got This!” page can be found at https://www.gofundme.com/d039shawn039s-got-this. Police report they are searching for a dark-colored Nissan Maxima (1995-1999) with front-end damage. Anyone with information is encouraged to contact the Delaware Police Department’s tipline at (740) 203-1112 or Policetipline@delawareohio.net. Police report the crash remains under investigation. 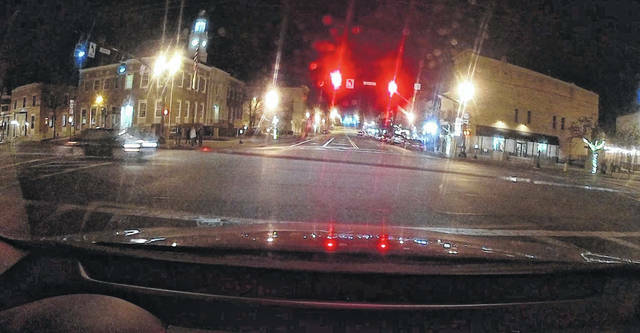 https://www.delgazette.com/wp-content/uploads/sites/40/2019/03/web1_CR19-128-Screen-Shot.jpgPolice released this screenshot from a dashboard camera in a vehicle waiting for the light at South Sandusky Street and are asking anyone with information about the vehicle to contact their tipline at at (740) 203-1112 or Policetipline@delawareohio.net.